I am absolutely loving the warmer weather and that spring is here. I received a beautiful flower arrangement this week from FTD on my door and not only did it brighten up my day but it looks beautiful in my new house! Spring has filled the inside of my house and I couldn’t wait to create a delicious recipe with Lucky Leaf Pie filling. I wanted to make an easy to make dessert for all of those spring gatherings. It shouldn’t come to a surprise to you that I wanted to make a no bake cheesecake. It is one of my favorite to make desserts and it is pretty hard to find someone that doesn’t like cheesecake. My favorite flavor of spring is lemon. And blueberry compliments the tartness of lemon so perfectly. The result of these bars were fantastic! It had the perfect amount of lemon and the cheesecake was oh so creamy! But the BEST part was the blueberry topping. Lucky Leaf makes such a quality pie filling and it was bursting with delicious blueberries and the glaze is perfection. 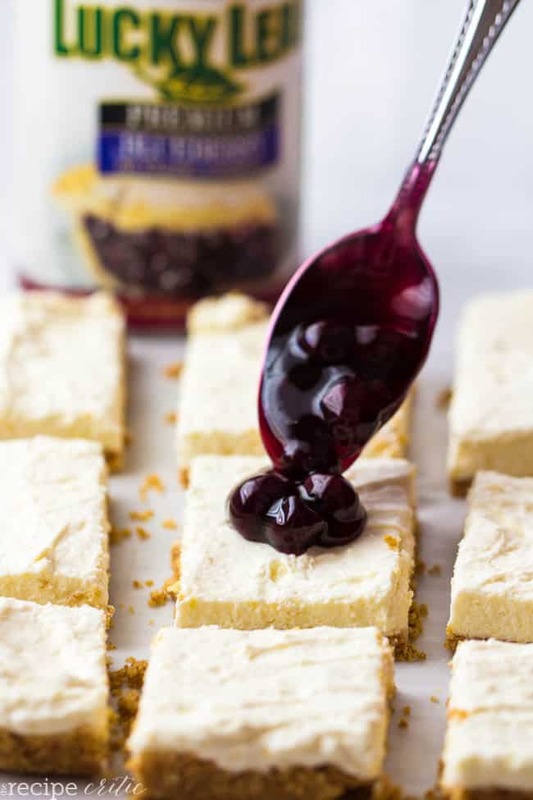 These delicious and easy to make bars would not have been complete with the blueberry topping! You are going to love it! FTD is extending a special offer to all of you!! Click HERE to get $10 off a spring arrangement! 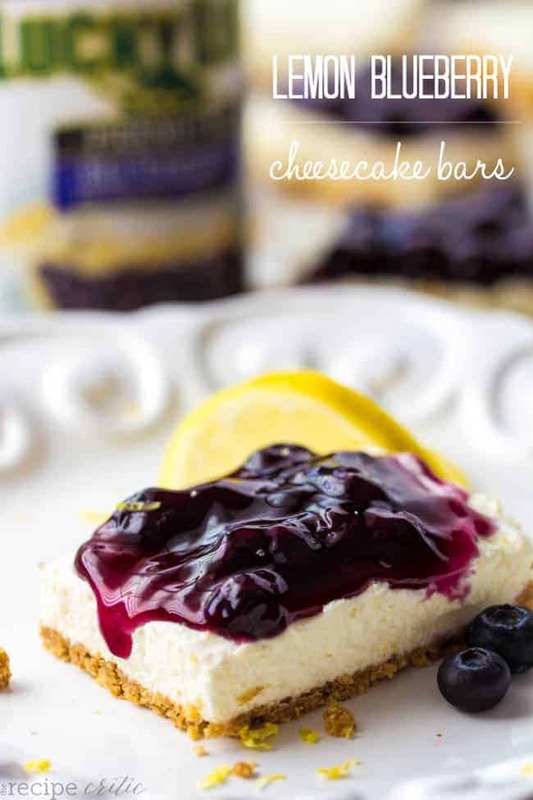 Delicious and creamy lemon no bake cheesecake bars with Lucky Leaf Blueberry topping! Line a 9x9 inch pan with aluminum foil and lightly spray with cooking spray. Set aside. In a food processor pulse the graham cracker crumbs until fine. Add the melted butter and stir to mix throughout. Press the graham cracker mixture firmly into the bottom of your 9x9 inch pan. Beat together the cream cheese and sugar until smooth. Add the lemon juice and zest from one lemon. In a separate small bowl, add the light cream and the gelatin. Microwave for about 30 seconds and stir the gelatin until dissolved. Add this to the cream cheese mixture and beat together until combined. Add the cream cheese mixture to the top of the graham cracker crust and spread evenly. Let chill for about 2-3 hours. 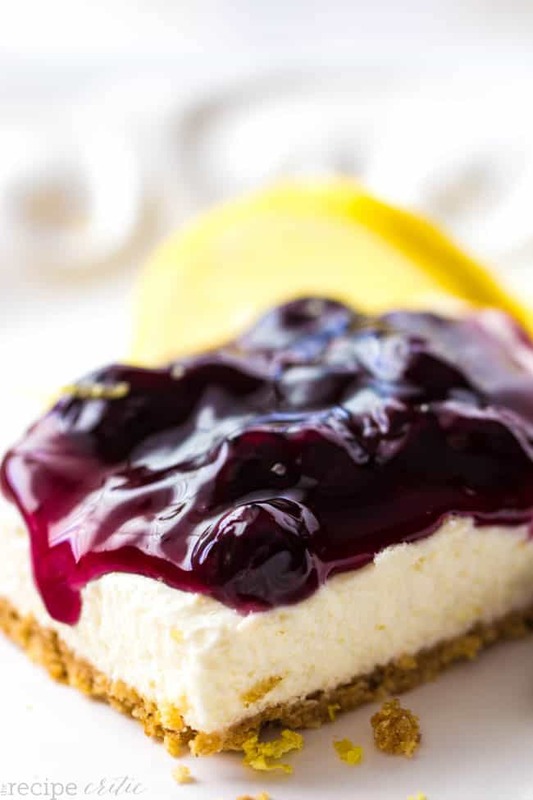 Spread the blueberry topping on top of the cheesecake layer once it is chilled and set. Cut into squares and enjoy! This post was sponsored by FTD and Lucky Leaf®. All opinions expressed are my own! The recipes looks devine and easy to make.send some more please! This looks delicious! I am wondering if it would work in a premade Graham cracker crust because everytime I try to make one it’s about 50/50 on whether it comes out right.